There are now almost as many versions of the board game Clue available as there are different variations of Monopoly. 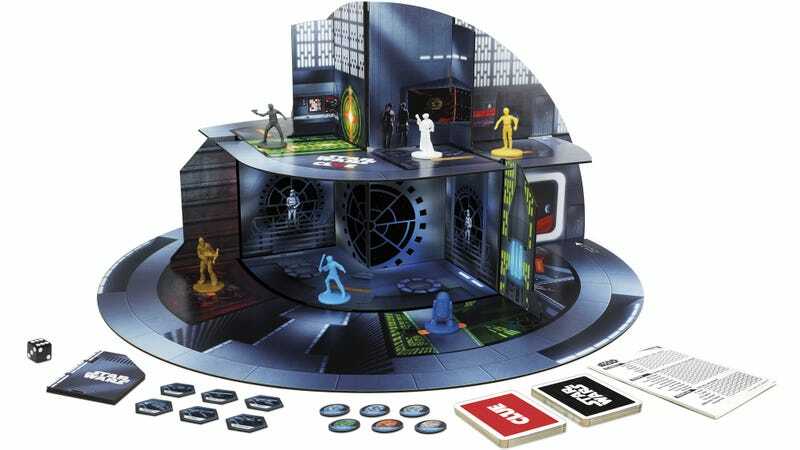 But Hasbro’s new Clue: Star Wars Edition includes a couple of unique twists on the classic game, including a 3D version of the Death Star where the mystery plays out. But the biggest twist you’ll find in this version of the game is that no one actually dies. Instead of solving a murder by figuring out who the killer was, what weapon they used, and where they committed the crime, Clue: Star Wars Edition ($25) has players trying to escape the moon-sized space station with a copy of the Death Star’s plans. Using their finely-honed deductive skills, players—taking the role of Darth Vader, Princess Leia, Luke Skywalker, Han Solo, Chewbacca, C-3PO, or R2-D2—must figure out what planet the Empire plans to target next with the Death Star’s massive laser, in what room the Death Star’s plans are hidden, and which vehicle they can use to safely escape back to the Rebellion. Correction 9:03 p.m.: The game only comes with six player tokens, and doesn’t include Darth Vader.